Justice H.R. Khanna Studies Circle cordially invites you to participate in the Justice H.R. 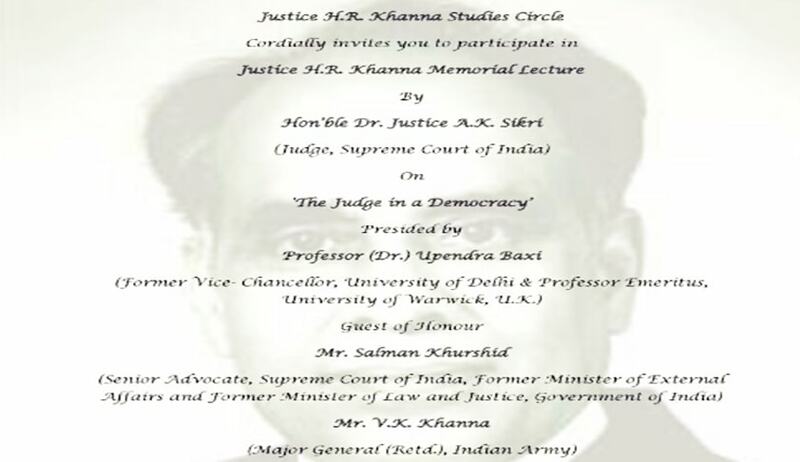 Khanna Memorial Lecture by Hon’ble Dr. Justice A.K. Sikri (Judge, Supreme Court of India) on 'The Judge in a Democracy'. The Guest of Honour shall be Mr. Salman Khurshid (Senior Advocate, Supreme Court of India, Former Minister of External Affairs and Former Minister of Law and Justice, Government of India) and Mr. V.K. Khanna, (Major General (Retd. ), Indian Army). The program will happen on October 13th, 2017 (Friday) from 5:30 p.m. onwards.